Cooking en papillote is a delicious way French women use to stay in shape and yet enjoy a tasty and beautiful meal. The beauty of this cooking method is that it is not complicated, it is quick and brings out the flavors and aroma of what you are cooking. Cooking en papillote is also a great way to vary your menus and be healthy at the same time. 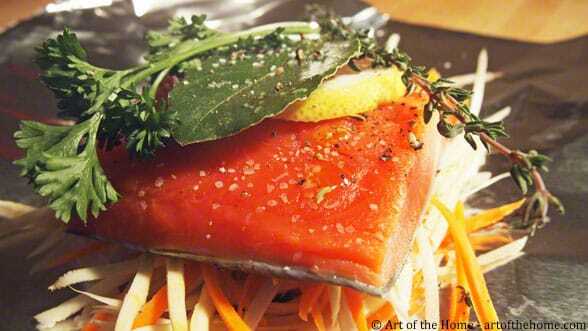 Many foods can be cooked en papillote. Although we mostly associate cooking en papillote with fish and seafood, you can also use this cooking method for vegetarian side dishes or white meat such as poultry. When cooking fish en papillote, your fish can be ready to serve – tasty and moist – in about 15 minutes, got to love that! So what does “en papillotte” means really? It simply means that you cook your fish (or meat, vegetables) inside a sealed wrapper (or pouch) so your fish is steam cooked inside the papillote (wrapper). The result is a flavorful fish, infused with all the aromas of the vegetables, herbs and spices you put inside the pouch. And you will love the cleaning up: just toss the papillote wrap, and voilà! For everyday cooking en papillote, we use aluminum foil — it is much cheaper than parchment paper and works just as well. However, if you want to fancy it up, you can certainly use parchment paper which does look prettier on a plate (note: the method for closing your papillote will be a bit different with parchment paper). And consider this, if you add enough vegetables to your papillote, this is a one-pot only meal and there is not pot to clean! So check the Art of the Home easy steps below on how to cook en papillote, as well as Art of the Home suggestions, and have a healthy dinner ready (vegetables included!) in about 15 minutes! Enjoy and bon appétit! Prepare vegetables to be placed inside your papillote. Great vegetables to add are: carrots, leeks, turnips, or parsnip but just use what you have handy. The key is to cut them thin so they can cook quickly – preparing them as if you would make a julienne vegetables works great. Cut out a piece of aluminum foil large enough to wrap your fish in it. Repeat to have the same number of pieces of foil as your number of fish filets. 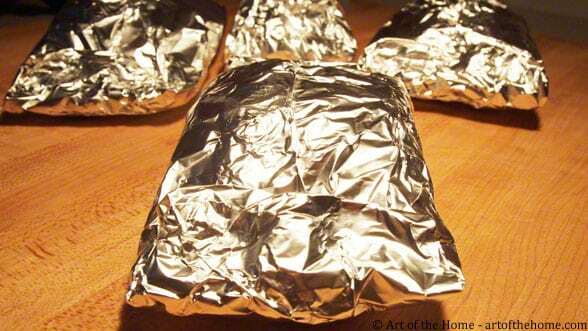 Lay one foil flat on a cookie sheet (to ease clean up even more, you can line your cookie sheet with aluminum foil). Place your vegetable at the center of the cut foil to make sort of a bed of vegetables for your fish. 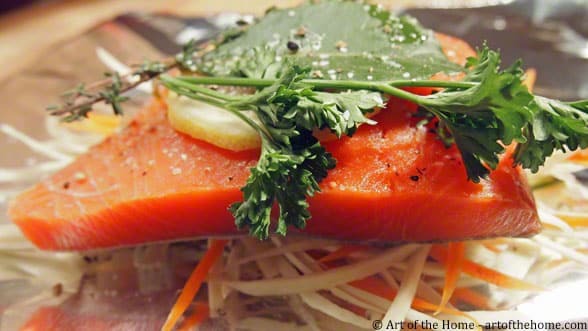 You can save some vegetables to put on top of the fish as well but it is not necessary. Place your fish on top of your vegetables, skin down. Salt (a good pinch of fleur de sel) and pepper (1 round or so of pepper mill) then add your herbs. A delicious combination is to sprinkle a few fennel seeds, add a laurel leaf, a thin slice of lemon, a sprig of thyme and branch of parsley but there are no rules really — just use your favorite fresh herbs (less but fresh is better) or whatever you have in hands. Finally, drizzle with olive oil (filet d’huile d’olive). Seal your papillote by double folding the aluminum foil on top and then on the sides — as you would wrap a present (see 2nd picture above). Repeat for each fish filet. Bake in the middle rack of your oven for about 15 minutes (this will depend on the thickness of your fish and how cooked you like your fish). After 15 minutes, take a look to check (very carefully, the aromatic vapors are really hot!). If your fish needs more cooking, seal again and bake for another few minutes. Serve your papillote by either putting each one on a dinner plate and opening it up on top or you can take the fish and vegetable out, arrange them nicely on your plate without forgetting to pour some of the herb and vegetable juices on top of your fish – si bon and healthy too! Side dish: although this is perfect for as is, you can certainly add a timbale of rice for a dinner with starch. Instead of butter on your rice, you can flavor it with the juice of your papillote.